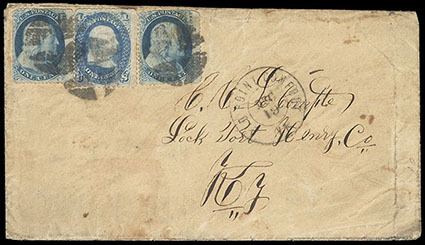 Confederacy, Flag of Truce Cover, franked with 1861 1¢ blue (US 63) with two demonetized 1857 1¢ blue (US #24), tied by cork cancels stamps and postmarked "Old Point Comfort, Va., Dec 19" double circle, cover sent to Lockport, KY., stamps with small faults, some cover wear and soiling, F.-V.F. ; with 1998 P.F. certificate. The demonetized postage was accepted at Old Point Comfort and upon arrival at Lockport, KY. 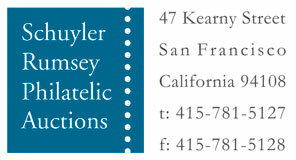 Original letter accompanies cover. The letter was written by Lt. Joseph Lecompte, Louise's Brigade, 41h KY Regiment, Company D; datelined, "Dalton, Ga., Dec 71h, 1863". Joseph mentions in his letter to write to him "by flag of truce" as he had written several letters home with no answer. Confederacy, Fort Pulaski (Savannah Ga.), "Tallahassee Fla., Apr. 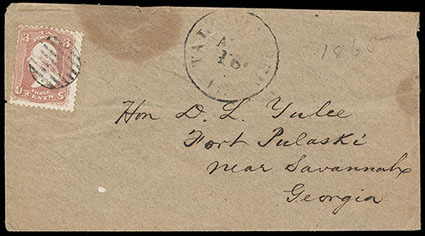 18" cds on homemade cover bearing U.S. 3¢ rose (65), tied by matching black grid and addressed "Hon D. L. Yulee, Fort Pulaski, near Savannah Georgia"; couple light stains, F.-V.F. David L. Yulee was a delegate and Senator from Florida, serving two terms as Senator including 1855-1861 until withdrawal. Due to his support of the Confederacy, he was arrested at war's end and imprisoned at Fort Pulaski until the Spring of 1866. 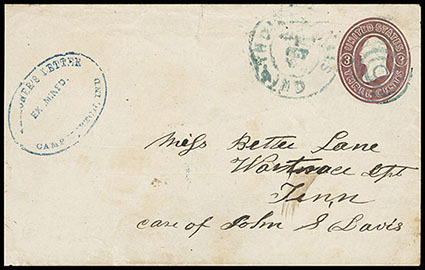 Confederacy, Alton Prison, 1861 3¢ rose on Civil War Prisoner of War cover tied by blue target cancel with matching "Alton, Ill., Jul.23, 1862" double circle postmark with a manuscript examiner's marking, "Ex. J.B.M. 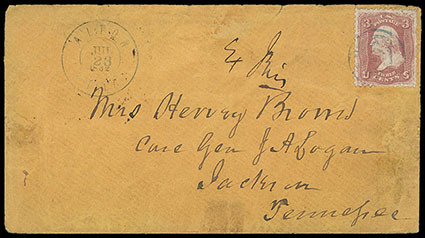 ", backstamped with part strike of "Cairo, Ill." cds, sent to Mrs. Henry Brown, care of General J.A. Logan, Jackson, Tennessee. Henry's letter to his daughter accompanies cover which mentions, "There are some 600 to 800 Prisoners here. ", flap missing, Very Fine. A VERY RARE PRISONER COVER WITH A MERE 12 COVERS RECORDED FOR THIS PRISON. 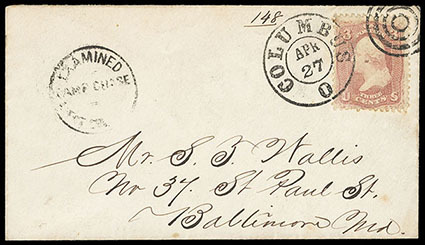 Confederacy, Camp Chase, Columbus, O., prisoner's cover bearing U.S. 1861, 3¢ rose tied by sharp strike of "Columbus, O., Apr 27" duplex to Baltimore Md., "Examined, Camp Chase, Lieut Col." circular handstamp (type Ib); small part of flap missing, Very Fine. Confederacy, Camp Morton, Ind., U.S. 3¢ pink (U34) entire with unusually sharp strike of blue oval "Prisoner's Letter Examined Camp Morton, Ind." handstamp and cancelled by "Indianapolis Ind., 1 Oct" cds duplexed with target cancel to War Trace Tenn.; reduced slightly at left, Very Fine and scarce. C.S.A. Catalog No. PWH-15 $500. Confederacy, Camp Morton, Ind., buff cover with blue oval "Prisoner's Letter Examined Camp Morton, Ind." handstamp (CSA PWH-15) and bearing 3¢ rose (65), some perf toning, lightly tied by blue target cancel duplexed with "Indianapolis Ind., 5 Aug '64" cds to Nashville Tenn., Very Fine and scarce. C.S.A. Catalog No. PWH-15 $500. 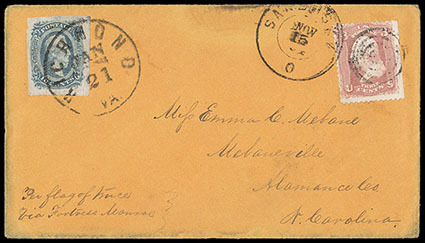 Confederacy, Elmira Prison, cover franked with 10¢ blue (four margins) tied by red Petersburg, Va. cds and sent to Harrington, N.C., the cover was reused and addressed on the reverse to "l M Dougald, Prisoner's Camp, Elmira, NY, Ward No. 43, Care of Maj. Colt", postmarked Harrington, N.C., Jan 3 (1865), docketed on obverse side, "Answered Sept 28, '64", some overall soiling, Very Fine, This cover most likely was sent under separate cover from there to Richmond, Va. by Flag of Truce via Old Point Comfort, VA. 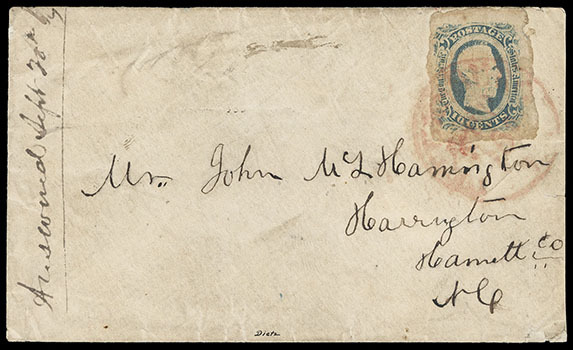 Both CSA & US postage was paid by the NC postmaster, John Harrington, who neglected to note the payment on the cover. ; signed Dietz. Major Henry V. Colt of the 1041h NY Volunteers served as the direct camp commander under Col. Seth Eastman and Col. Benjamin Tracy. His brother was the famous Samuel Colt, inventor of the revolving breech pistol. Elmira Prison camp operated by the United States government during the War between the States was in use from 6 July 1864, until 11 July 1865, and was dubbed "Hellmira" by its inmates. During those 12 months, 2,970 of the 12,100 prisoners would die from a combination of malnutrition, continued exposure to harsh winter weather, and disease from the poor sanitary conditions on Foster's Pond combined with a lack of medical care. 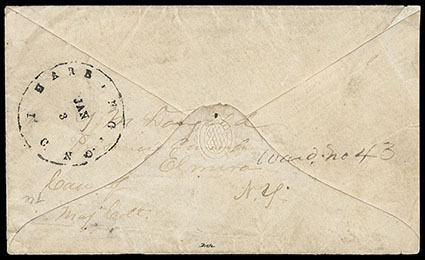 Confederacy, Johnsons Island, Sandusky, O., prisoner cover bearing U.S. 1861, 3¢ rose tied by "Sandusky, O., Nov 15 '64" duplex and addressed to Miss Emma C. Mebane at Mebaneville, N.C., in combination with 1863, 10¢ blue, four large margins, tied by ""Richmond, Va., Jan 21"" cds, reverse with "Prisoner's Letter, Johnsons Island O., Examined, GSB" oval examiner's handstamp, endorsed "Per Flag of Truce via Fortress Monroe"; minor edge discoloration, Very Fine, ex-Warren. Scott No. 11+U.S. 65 Estimate $1,500 - 2,000. 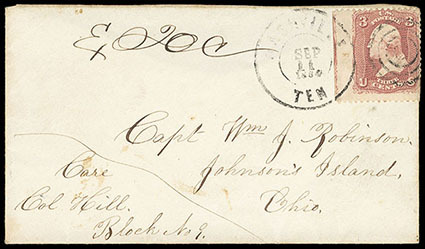 Confederacy, Johnsons Island, Sandusky, O., incoming cover to Capt. Wm. J. Robinson bearing with U.S. 1861, 3¢ rose (65) tied by "Nashville, Ten., Sep 11, 1864" cds and target duplex, manuscript "Ex, TOC" censor marking (examiner Theodore O. Castle); flap mostly missing, Very Fine. 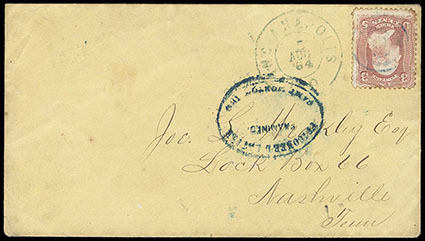 Confederacy, Ohio State Penitentiary, Columbus, O., Ohio State Penitentiary, Columbus, O., franked with 1862, 5¢ blue (uncancelled and overpaid drop rate) on cover addressed to "Mrs. Genl John H Morgan Care of Col. W. Preston Johnston, Richmond, Va." with notation "Capt. Hatch will please forward"., small cover tear at top & bit of flap missing, Very Fine, this cover was from one of General Morgan's officers being held with Morgan at Ohio Penitentiary Prison after their capture. Brig Gen. John Hunt Morgan was a perfect Southern gentlemen even during battle. Even though Morgan didn't have much formal military training, he possessed an instinctive talent that made up for his lack of training. He was a fearless leader and he quickly earned the respect of his men. General Morgan operated mainly in the Western theater under Major Gen. Joseph Wheeler; he was famous for his raids into Tennessee and Kentucky. In July of 1862 Gen. Morgan and his men began raids in Kentucky that lasted three weeks while being chased by Federal troops, but were never captured. In July of 1863, Gen. Morgan and his men took part in their final raid, during a 24 day ride into Southern Indiana and Ohio, which ended when Gen. Morgan was captured. Morgan was sent to the Ohio Penitentiary, where he escaped. Morgan was shot and killed in a surprise attack by Federal cavalry at Greeneville, Tenn. on September 3, 1864. Hatch was the Confederate Assistant Prisoner Exchange Agent. The Col. Johnston was Aide de Camp of President Davis and son of General Albert Sidney Johnston (killed in action at Shiloh).